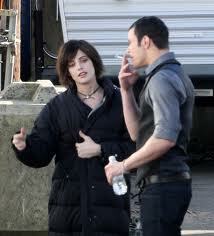 Ashley and Kellan on the set of New Moon. We guess they didn’t get sick of working with each other, because Twilight stars Ashley Greene and Kellan Lutz are now planning on becoming roomies. Hollyscoop.com talked to Greene about how her new living arrangement is going to work. “We have been discussing possibly sharing a place in New York because we both always talk about how much we go and how much we love it,” Greene told Hollyscoop.com at the Ella Moss 10-year anniversary event. And while their relationship is strictly plutonic, we can’t help but wonder if there might be a budding romance going on. “I think the rule is don’t bring anybody home, ever,” Green told HS. The two are apparently BFFs off set, and they play adopted siblings in Breaking Dawn so it would sort of incestual if they did hook up. .